When buying and selling mortgages or trust deeds you need to get the original promissory note! Put it in a safe place where it won’t get lost and make sure it comes with endorsements and assignments that follow the chain of ownership. You know, something that proves you own what you say you own. It’s one of those things you don’t think about until you need it. One of those times happens to be when the buyer or borrower stops making payments. a certain balance is due and owing. Well, the promissory note is an obligation to pay, kind of like a check. If you want to cash the check you have to present it to the bank. If you want somebody else to get payment then you have to endorse and sign it on the back. As banks bought and sold mortgages during the securitization craze many notes were lost or transferred without accurate paperwork. Lenders would then rectify the problem by substituting an affidavit of lost note. For many years the courts would routinely overlook missing paperwork or accept the affidavits when granting foreclosures. But then the bubble burst, the real estate market came crashing down, and foreclosures skyrocketed. Disgruntled homeowners and consumer advocates started demanding lenders produce the note in an effort to stop foreclosure. This movement scored its first big success in Ohio back in 2007 when a federal judge denied 14 foreclosures by Deutsche Bank National Trust Co. because the bank didn’t produce the original notes. Since that time homeowners and attorneys have used this delay tactic at an alarming rate. They’ve also extended claims to other mishandled paperwork, contributing to the temporary foreclosure freeze announced by Bank of America, GMAC, and Chase in October 2010. So what does this all mean to the cash flow business? If you are a Seller that accepts owner financing be sure to protect yourself by keeping the original note in a safe place. If you are a Note Broker, verify the seller or a third party servicing agent is in possession of the document so it can be produced at closing. Note Investors will continue to be diligent in requiring the original in order to buy mortgage notes. Click Here for a list of Note Buyers and Owner Financing Specialists! I have a lender that is foreclosing on a piece of real estate. Do you have a name of an attroney that will challenge the foreclosure because the lender hasn’t produced the original note. The property is in the State of Missouri. Also, do you or do you know of a company that will buy unsecured notes that are in default? And bad loans made by Corp’s to individuals that are in Bankruptcy? Hello Michael, You might want to network with the Note Investor group on LinkedIn. 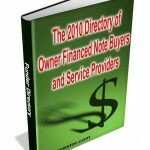 You can also search the archives of this site for investors specializing in defaulted notes or refer to the directory at: http://notebuyersites.com/getting-started/ I don’t currently have a foreclosure attorney contact in Missouri but perhaps other readers will chime in.